The late Joe DiGenova, a longtime Delaware City Council member, was honored posthumously with the Wayne Hilborn Lifetime Achievement Award during the Delaware Area Chamber of Commerce’s annual dinner and awards ceremony held Feb. 5. The award was accepted on DiGenova’s behalf by his family. Pictured at the awards ceremony, left to right, are Delaware City Manager R. Thomas Homan, Tim DiGenova, Jeff Feinberg, Vonie DiGenova, Tracy (DiGenova) Feinberg and Delaware Mayor Carolyn Kay Riggle. Not only did the late Joe DiGenova serve his country during the Vietnam War, but he also served his local community as well as a member of the Delaware City Council. Before passing away at the age of 71 in March 2017, DiGenova left a lasting impact on the city as its longest-serving council member, with 25 combined years of service. His dedication to the city and love for community service earned him, posthumously, the Delaware Area Chamber of Commerce’s Wayne Hilborn Lifetime Achievement Award. Formerly the Honor Citizen Award, Delaware business owner Jack Hilborn said the name of the award was changed to honor his late father, Wayne, after he passed away in 1994. “He was affectionately known by many as ‘Mr. Delaware,’ and for over 50 years, he gave back in so many ways to this community and Ohio Wesleyan University,” Hilborn said of his late father. As for the Wayne Hilborn Lifetime Achievement Award, Hilborn said it’s awarded to individuals who have dedicated their lives to community service, at least 10 years or more, and it’s only awarded when the Delaware Area Chamber of Commerce Board of Directors feels there is someone deserving of the honor. “I think you could make a strong argument that it’s the most coveted award given in the Delaware community,” Hilborn said. 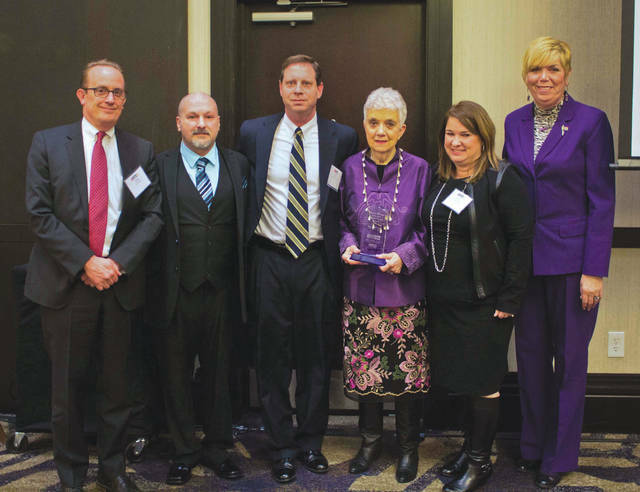 During the chamber’s annual dinner and awards ceremony held Feb. 5, Hilborn said he was honored to present the award to DiGenova’s family.